The “Land of high passes”, Ladakh is a picturesque region in the state of Jammu and Kashmir that is right on the top of every traveller’s bucket list. Perched on a height of 3,524 metres Ladakh is a perfect love affair between a barren yet beautiful land and pristine lakes. What adds on to the calmness of this place is the isolation from city’s hustle -bustle. Ladakh trip must certainly be in your travel list if you're seeking to venture out in nature's beauty. Leh Ladakh tour packages allow you to explore the most beautiful and the best kept secret of India. A heaven for bikers, trek-lovers and explorers, the rugged lands of Ladakh are open to all. Sharing its east border with Tibet, Leh Ladakh is enclosed by Tibet on the eastern side, Spiti-Lahaul regions in the south, while Kashmir Valley in the west. The crown jewel Ladakh is a name you will find on almost every travelers list. Leh Ladakh tour packages are favourite among all kinds of travelers; be it an adventure junky or someone who travels with their whole pack for the experience, Ladakh tour has something for everyone. 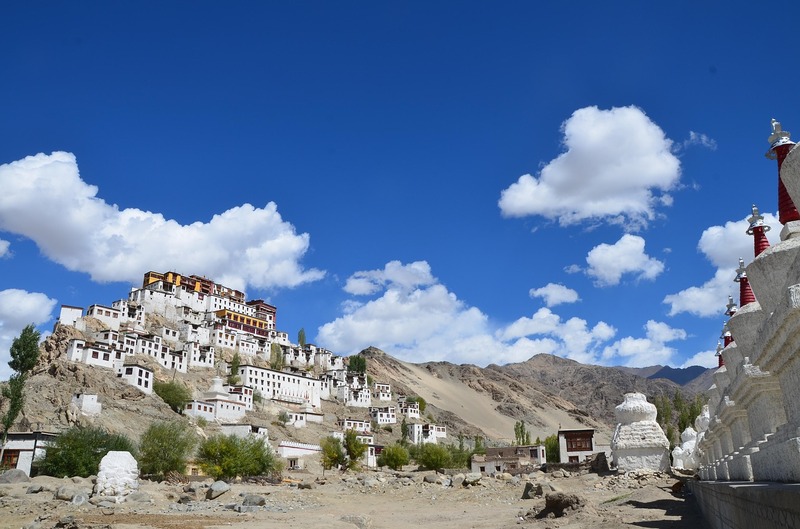 A Leh Ladakh tour of at least 10 days is required to see places like Leh, Sarchu, Shanti Stupa, Khardung La Pass and other major attractions of Ladakh. True to the proverb, ‘No risk, no reward’ – once you start your Ladakh trip, surprises galore in the form of beautiful views and vistas making your Ladakh tour more memorable. One of the favourite locations for the Bollywood industry and home to some nature’s wonder like Chadar trek, beautiful monasteries, unusual Magnetic hill and many more such wonders, no doubt why the Leh Ladakh tour packages are emerging out as the new favourite among travellers. The great Himalayan Mountains will be your companion through most of your Ladakh trip. The largest town in Ladakh, Leh is an epitome of scenic beauty and one of the major attractions in the Ladakh trip. Once you are here, there’s no other place which could be compared to the ecstasy one can experience amidst the mountains in Leh. Extensively jagged with colorful Tibetan prayer flags fluttering everywhere and with the mesmerizing beauty of snow-capped mountains, Leh is a treat to one’s eyes. With so many places to see in Leh, the biggest difficulty to plan your Ladakh tour is “Where to start?”. While it certainly is a difficult task, one can begin with Tso Moriri Lake. Situated at an elevation of 15000 ft. Tso Moriri is also called ‘Mountain Lake’, surrounded by the Himalayas and freshwater lake. The lake is home to many endangered species. Dipping in hot water springs amidst the cold region of breathtaking view and a bonfire camp will leave you with everlasting Ladakh trip memories. Nestled in the Karakoram range and another popular place in Leh which you shouldn’t miss in your Leh Ladakh package is Nubra Valley. 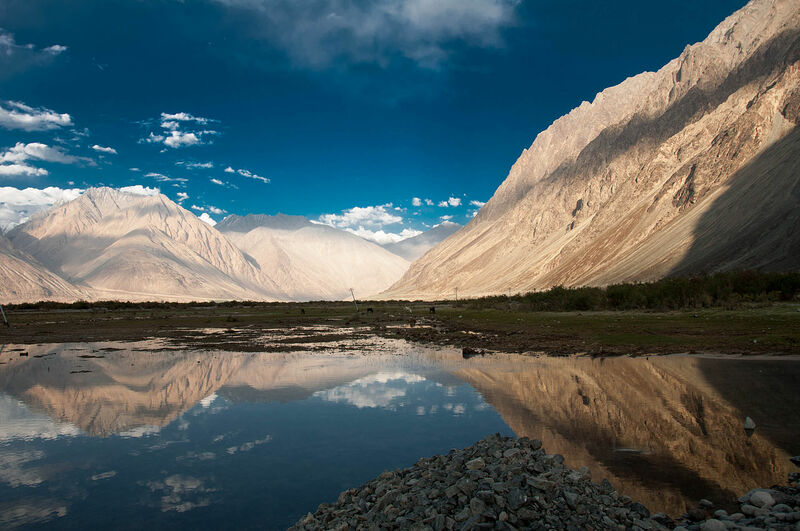 The sand dunes of the Nubra Valley offers tourist a very much Arabian Nights like experience. 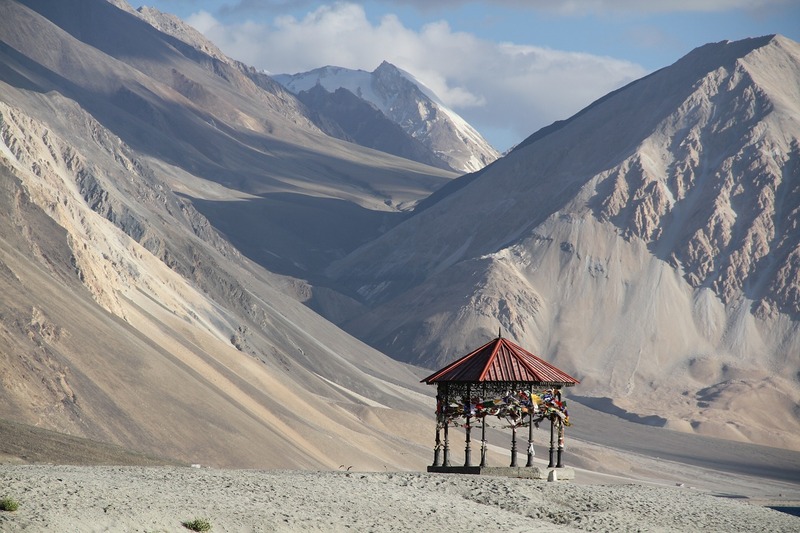 The beauty of the place and the view it offers are two of the primary reasons why this spot is on the itinerary of many Ladakh Tour. If you want to spiritually heal yourself, a visit to Shanti Stupa should be in your ‘must-visit’ list during the Ladakh trip. Constructed by the Japanese and situated at a height of 4267 meters, the Shanti Stupa offers a panoramic view of Leh and the majestic snow-clad mountains that surround it. Due to its height, you can watch the sunset and sunrise from this place. Trust us; the view will surely leave you awestruck. With an incredible view and a magnificent structure to accompany it, make sure you pick a Leh Ladakh tour package that takes you visiting this beautiful spot. If something unusual and weird is what attracts you, then Magnetic Hill or Gravity Hill is a spot you must visit in your Ladakh tour. Situated on the national highway from Leh to Kargil to Batalik, this has a unique anti-gravitational force and is one of kind ‘magnetic hill’ in India. It is puzzling to see that the hill seems to pull vehicles up to its slope when parked in neutral gear. Although this phenomenon is caused due to an optical illusion, it is surely a place where everyone is thrilled by science and a sight to see during your Ladakh trip. Known as the Land of the monks and monasteries, Ladakh has some of the most ancient, royal monasteries which reflect its sparkling history. Spituk Gompa is one of the many monasteries in the region. The monastery has around 100 monks and a Giant statue of Goddess Kali. The place is famous for its beautifully carved location atop a hill. With a collection of antique arms, masks, Thanka paintings, the view of the monastery is truly breathtaking! Spituk Gompa is a favourite of many Ladakh tour and rightly so. Two other very popular monasteries which are included in most of the Ladakh tour are Hemis Monastery and the Lamayuru monastery. Hemis Gompa is the biggest monastery in Ladakh. The annual Hemis festival that takes place in July attracts large number of people and that is when most of the Leh Ladakh tour packages are booked. The Lamayuru monastery, which is also known as the “Moonland”, is a best place for star gazing. The place will truly show you how being away from the city’s hustle-bustle you can have one of the best nights in your life. While exploring the majestic land of Leh Ladakh one cannot miss the famous Leh Palace. The ancient Leh Palace might have lost its grandeur, but it is a must visit place a historical architecture lover. Built by the King Sengge Nangyal in the 17th century, it is a 9 stories high. The top floors accommodate the royal family and lower ones are used as storerooms. The place has a panoramic view of Stok Kangri and Zanskar ranges across the Indus Valley. If you are an adventure junkie and wish to indulge in a nerve-wracking expedition, Chadar Trek is an ideal choice to make. This frozen river trek is the most enticing treks of all. So, if you are planning to go on a trek then be ready because this trek is beyond ordinary and could be the most challenging treks of your life which could give you an adrenaline rush like nothing else. Visitors can experience the local way of living, beliefs and culture. Interact with the locals of Ladakh for an unforgettable experience. The locals are very friendly and always willing to share their experiences and stories of Ladakh. The monks and children will go out of their way to get you accustomed to the culture of Ladakh and make you feel at home. Above all, food is the best reason to travel for. Indulge yourself in the delectable local cuisine of Leh and if you get a chance visit a home to experience it in the best way. From Tibetan Stew and Tibetan fried Ba Ba Bread to Tigmo and butter tea. As for Tibetan food, words are not sufficient. Taste and aroma are the only parameters. Leh Ladakh is a beautiful amalgamation of Indian and Tibetan culture which reflects in its cuisine and architecture. 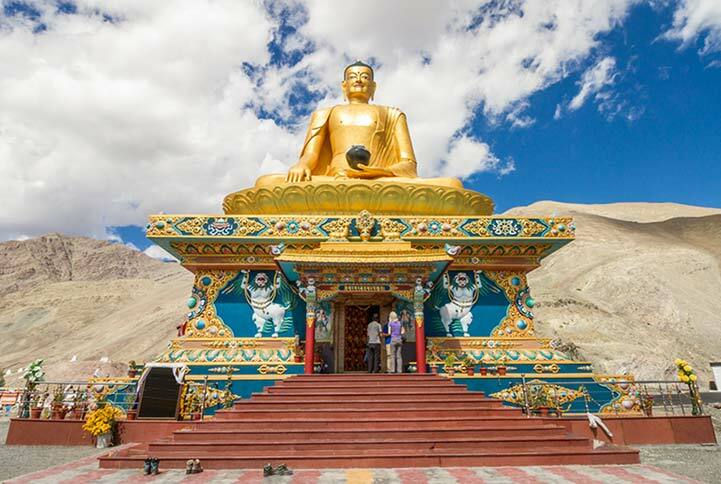 If you want to explore the pristine beauty of Leh Ladakh, all you need to do is pick the best Leh Ladakh tour packages from the varied range of Akbar Holidays packages, pack your backpack and embark on your adventure-filled trip. I authorize Akbartravels.com to contact me and have read the Terms and Conditions.